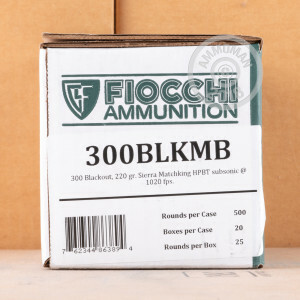 This 300 AAC Blackout cartridge by Fiocchi is capped off with a 220 grain bullet, the heft of which assures that its muzzle velocity will always hover below what it would take to shatter the sound barrier. 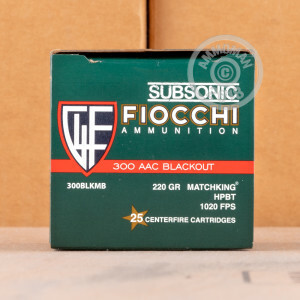 The softer report of subsonic ammunition like this is still markedly audible, but it does a fine job of making your target shooting session far less conspicuous. It’s also great for introducing easily startled neophytes to the world of marksmanship, and it barely registers a squeak when fired from a silenced firearm. Its low muzzle velocity doesn’t greatly impact this round’s accuracy, because it’s outfitted with a Sierra MatchKing projectile. The bullet sports a boat tail design, so its ballistic coefficient is high enough to ensure a flat trajectory, superior velocity retention downrange, and greater immunity to wind drift. 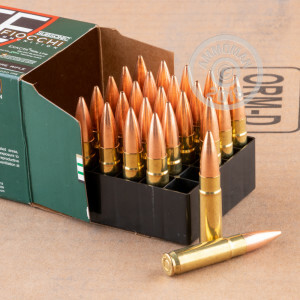 This bullet’s jacket is highly concentric to improve its rotational stability, and its hollow point meplat is narrow to further improve its aerodynamic profile.